Immunogen: Synthetic peptide corresponding to the sequence near the N-terminus of rat PGD2 receptor (DP1). Crossreactivity: Predicted species reactivity based on epitope sequence homology: mouse. Scientific Background: The conversion of arachidonic acid to prostaglandin H2 (PGH2) by cyclooxygenase (COX) enzymes is the first step in the synthesis of prostanoids. Prostaglandin D2 (PGD2) is synthesized from PGH2 by the action of PGD synthase, and its actions in vasodilation and platelet activation are mediated via activation of two identified G-protein coupled receptors (GPCRs): DP1 and DP2 (formerly CRTH2). Both DP1 and DP2 receptors are coupled to Gs alpha subunits, resulting in increased adenylyl cyclase activity and cAMP production upon agonist binding. DP1 receptor is expressed moderately in the ileum and weakly in the lung, stomach, and uterus of mice, and weakly in the small intestine of humans. In rodents, expression of PGD synthase and the DP1 receptor is seen in the leptomeninges, where it is believed they play a role in the induction of sleep. The DP1 receptor may also oppose DP2-mediated activation of basophils, eosinophils, and Th2 cells. Western blot analysis: MW marker (1) and 20µg rat brain extract (2) probed with PGD2 Receptor (DP1) pAb at 4.9µg/ml. 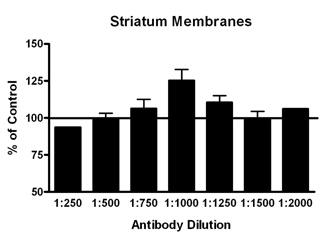 Membrane ELISA: Lewis rat striatum membranes (5µg/well) were treated with 1μM concentrations of agonist (PGD2/BW245C) and probed with PGD2 Receptor (DP1) pAb (1:250 to 1:2000 of a 1µg/μl stock solution) by ELISA. Data from vehicle treated cells were taken as 100%. Results are the mean ± SEM (n=2).